During last year’s Art Basel Week, the world was first introduced to the newly formed TrustoCorp with their unique take on urban art, in which they beautified a host of South Beach sign posts (covered). It looks like the socially conscious street art collective, along with the assistance of Contra Projects, is returning to the scene of the crime and has some big plans for this year’s art festivities in Miami. The subversive collective, who typically spend their time enriching urban neighborhoods – yet simultaneously antagonizing city workers – with cleverly conceived and graphically compelling mock street signs addressing the ills of modern America, will be unveiling TrustoLand, an elaborate outdoor carnival style installation with plenty of crazy games to play and prizes to win. Further collaboration between the two groups will include a unique lounge style tent, as well as a Wynwood Walls mural project in conjunction with Primary Flight. TrustoCorp has been on a roll with successful gallery exhibitions in NYC (covered) and LA (covered), so this should be a great way to end their year where it all began last year. 1. The Contra Tent – In the Courtyard of 297 NW 23rd. St. (Between NW 2nd Ave. & NW 5th Ave.) Wynwood. The Contra Tent will be a lounge style tent with free refreshments (including limited edition Brisk Iced Tea cans designed by Tristan Eaton) as well as information on Contra Projects and their artists. The center piece of the tent will be a custom, fully functional, lowrider shopping cart by street art collective TrustoCorp. The Contra Projects mural will feature Ron English, Mr Jago, Thomas Thewes, Bask, Tes One and Tristan Eaton. Most Contra artists also have solo walls throughout Primary Flight, please check in at the Contra Projects tent for more information. 3. TrustoLand – In the Courtyard of 297 NW 23rd. St. (Between NW 2nd Ave. & NW 5th Ave.) Wynwood. 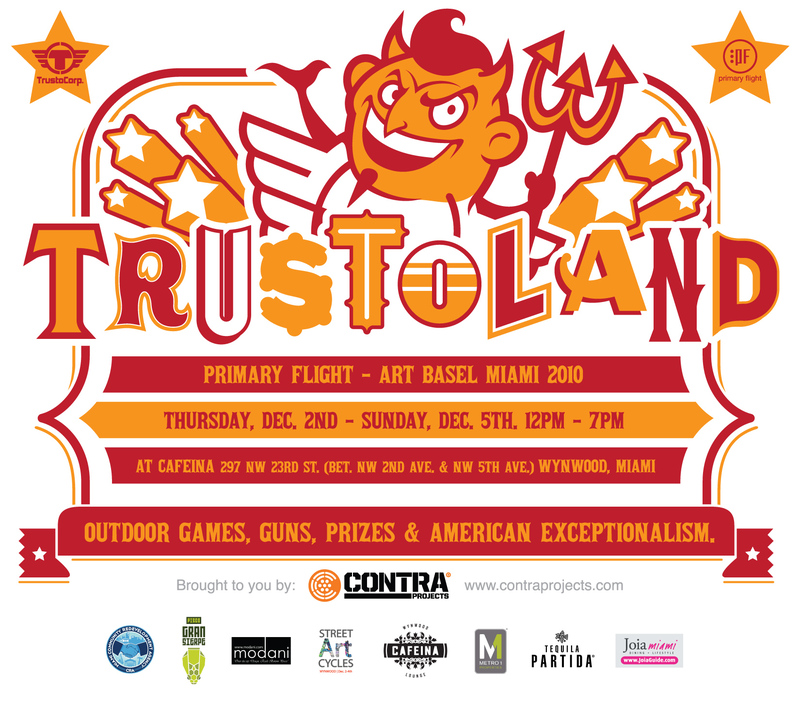 Trouble making street art group TrustoCorp takes it’s humorous slant on American Culture to new levels at Primary Flight Miami this year with the debut of ‘TRUSTOLAND’, a Coney Island style, outdoor installation of interactive, hand made and painted carnival games. Each game takes on American culture for better or worse with typical TrustoCorp sarcasm and satire. How participants play the games determine what prizes they win – yet just like Wall Street, even the losers win big. Highlights include ‘The TrustoCorp Immigration Office’ where contestants play for citizenship, the high-striker style ‘The Peace Keeper’ and ‘Drive-Thru Safari’ where players use an AK-47 BB Gun to shoot innocent burgers and hot dogs on the run. Prizes include limited edition, signed posters, badges and plush cheeseburgers! Categories: Contemporary Art, Fairs, Low Brow & Pop Surrealism, Shows & Events, Street & Urban Art, Teasers. Tags: Art Basel, Art Basel Week Miami 2010, Art Fairs, Bask, Contra Projects, Mr. Jago, Primary Flight, Ron English, Teasers, Tes One, Thomas Thewes, Tristan Eaton, TrustoCorp, TrustoLand, Wynwood Walls, Wynwood Walls 2010.